Ideally located for University of Western students, 939 Western Road offers spacious one, two and three bedroom apartments for rent in London. If you're looking for high-quality living in London, you've found it at 939 Western. A private building on the 2 Dundas bus route which comes every 5-7 minutes will take you right to campus and downtown in minutes. 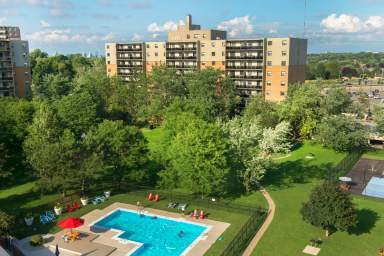 Our convenient location lets residents enjoy nearby parks, grocery stores and restaurants. Come visit us at 939 Western! We offer one, two and three bedroom apartments with recently upgraded kitchens and bathrooms and hardwood floors throughout. Our convenient location means you're just minutes from Metro, LCBO, local restaurants and cafes, The Cherryhill Mall, Shoppers Drug Mart, parks and the University of Western Ontario's campus. Our spacious one, two and three bedroom apartments include all the amenities you deserve, such as, recently upgraded kitchens with ceramic tile and modern bathrooms, upgraded common areas with computer and gaming stations, and visitors parking for friends and family. When you live at 939 Western, all that London has to offer is at your doorstep. Living near campus means you can enjoy all the nearby amenities including shopping, community events, and entertainment. Many of our residents also love to take a jog or bike next to the Thames River, just a few steps from our front doors. Call 519-914-2781 today to schedule a tour of 939 Western!